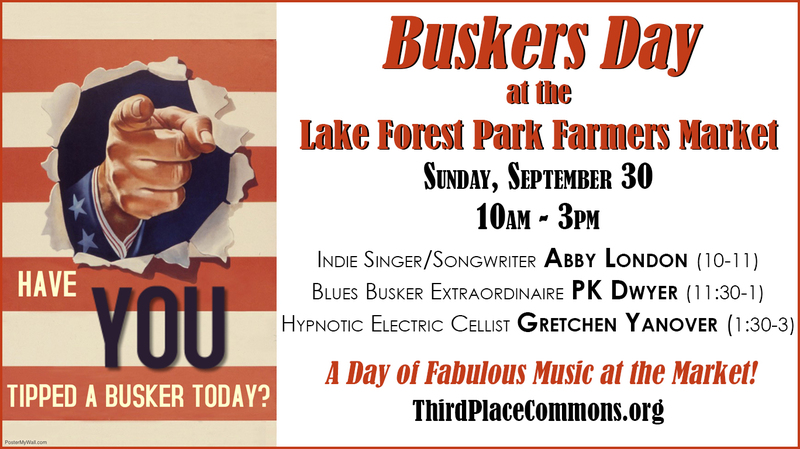 Last year’s Buskers Day was a hit, so the Lake Forest Park Farmers Market is doing it again! This coming Sunday, September 30th, the market will feature three knockout talents who will entertain you with a musical journey both unexpected and thrilling. Presented each Sunday by Third Place Commons, the LFP Farmers Market always welcomes terrific local buskers who regularly drop-in to fill the market with great acoustic music. But for one day only, the market is turning up the microphone and shining the spotlight on some truly talented and accomplished musicians who will knock your socks off with their musical chops. The market will open with the gifted indie singer/songwriter Abby London from 10 to 11am. A classically trained musician with an ear for everything from pop, rock, and hip hop to folk and show tunes, Abby’s sound is reminiscent of revered icons like Regina Spektor and Ani DiFranco. But as you’ll see and hear, with her clever lyrics and unique perspective, Abby is an original unto herself. PK Dwyer, blues busker extraordinaire, takes the mic from 11:30am to 1pm. PK is credited as the first person ever to busk at Pike Place Market, and ten years later he won the First Annual Street Performers Competition in Paris. He has continued playing hard ever since! PK has made a lifelong career as an esteemed street performer and still plays about 300 dates a year, dazzling folks with his virtuosity and high energy originals. Be sure to stop by and see what all the fuss is about! Finally, the day will wrap up from 1:30 to 3pm with the dreamy, ethereal beauty of electric cellist Gretchen Yanover. A classical musician by training, Gretchen discovered “a new voice for her instrument” with the introduction of a loop sampler. Gretchen builds hypnotic melodies and atmospheric landscapes right before your eyes that will captivate your heart and fuel your imagination. She’s too good to miss! All three of these musicians are unique and gifted performers who will delight and inspire with their fabulous music. So when you see them and love them (and you will! ), be sure to tip them! They also all have music for sale on their websites, so when you head home from the market, you can download their great music to enjoy again and again. So don’t miss the fun at the Lake Forest Park Farmers Market, this Sunday (and every Sunday through October 21st) from 10-3pm in the parking lot of the Lake Forest Park Town Center at 17171 Ballinger Way NE.